When Jack and I were planning our trip to Italy earlier this year, I reached out to my friends on Facebook and asked for recommendations. My friend Marc forwarded my post to his friend Donna, who had just returned from a trip to Italy. 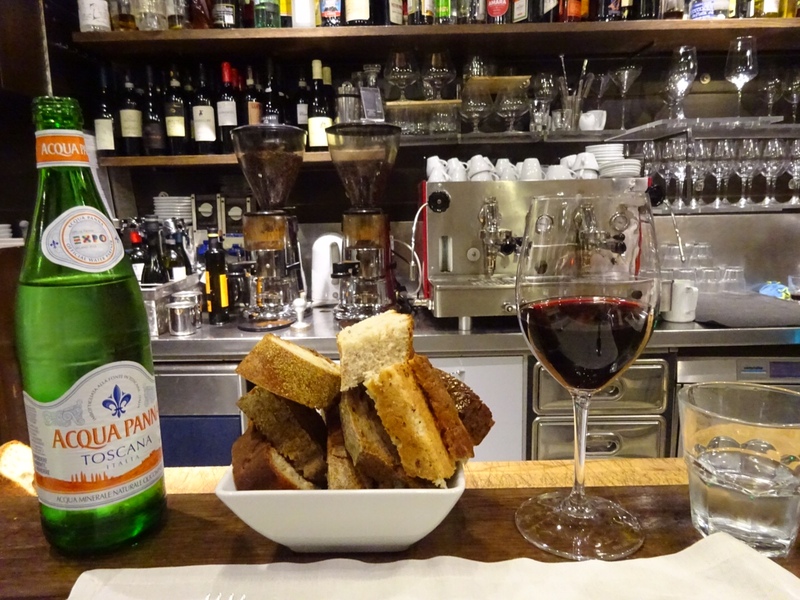 Donna (whom I have never met) generously emailed me a two-paged document full of tips for Rome and the Amalfi Coast; this list included Roscioli, a restaurant just south of Campo de’ Fiori in central Rome. 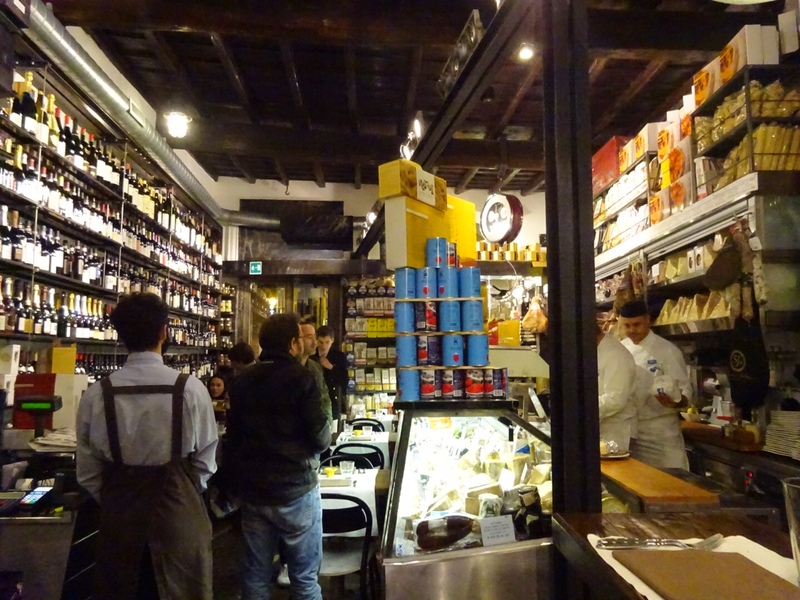 Roscioli actually has several different locations and functions: Salumeria Roscioli (the main restaurant and salumeria), Rimessa Roscioli (wine and food tasting space that Donna recommended), and Antico Forno Roscioli (the Italian bakery). We were not aware of these distinct spots, so when we asked our hotel concierge to book us a table at Roscioli, he assumed we meant the restaurant, rather than the wine tasting. 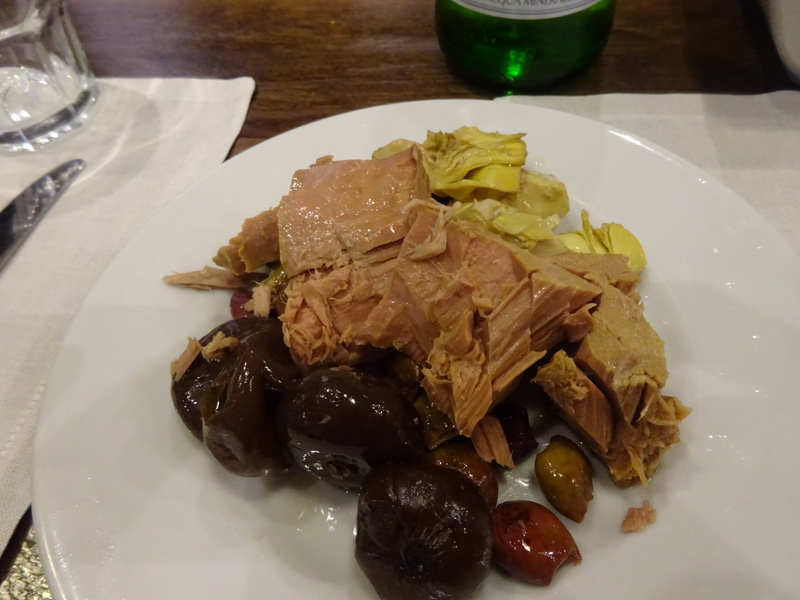 But, as often happens in life, the mix-up was pure serendipity, and our meal at Salumeria Roscioli ended up being one of the best meals we had in Italy. Entrance to Roscioli. Specialty foods and wine on display for purchase. 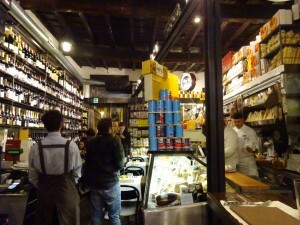 The space at Salumeria Roscioli is cozy and lively, a cross between a deli, grocery store, and wine bar. 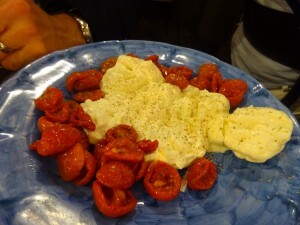 Its central location and recent publicity have attracted a tourist following, but the food is authentic Italian. Everything we ate was fantastic, and we left full and happy. 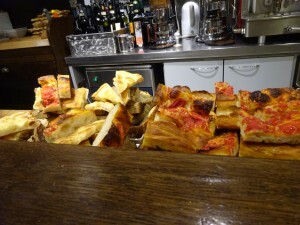 This is why, when I had the opportunity to return to Rome five months later for a conference, I immediately booked a reservation at Salumeria Roscioli. 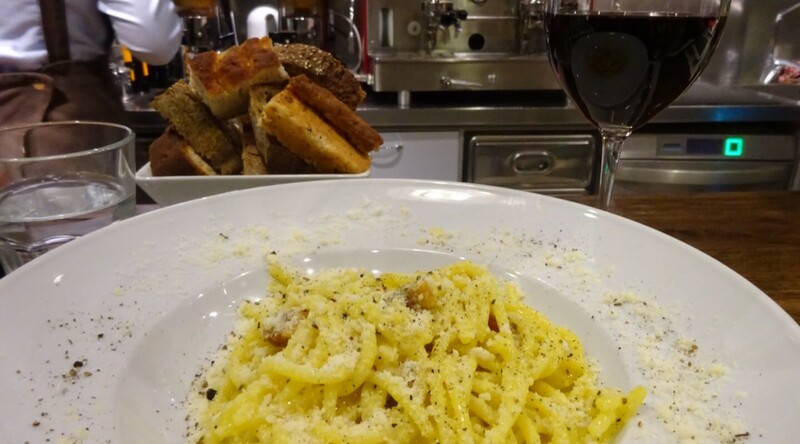 I had been dreaming of the carbonara pasta and I had to have it during my short stay in this ancient city. The food menu at Roscioli is quite lengthy and highlights many of the classic dishes of Roman cuisine. I typically prefer a shorter menu to ensure that each dish is stellar and all ingredients are as fresh as possible; we definitely utilized our server as well as Yelp’s “review highlights” to identify some of the more popular dishes on the menu. If you have any food allergies or intolerances, you will appreciated that the menu clearly identifies which foods include gluten, shellfish, dairy, etc. 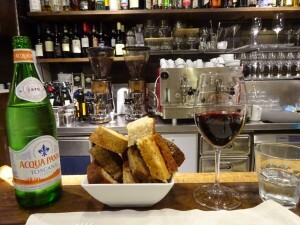 Both times I ate at Roscioli the server brought us a generous serving of bread. 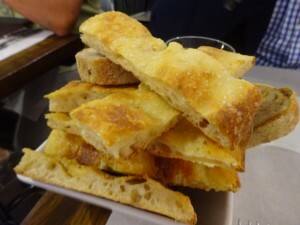 This was a mixture of focaccia bread (some with tomato sauce, like pizza) as well as a variety of chewy Italian breads. I assume that this is made down the street at their Italian bakery, Antico Forno Roscioli. If you dine at Roscioli, be sure to request some of the focaccia; as you can see, I was served more focaccia when I was there in the summer, so I suspect it depends on what they have on hand. 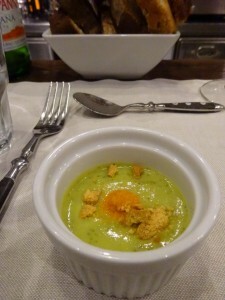 The server then brought out a small soup to cleanse the palate. 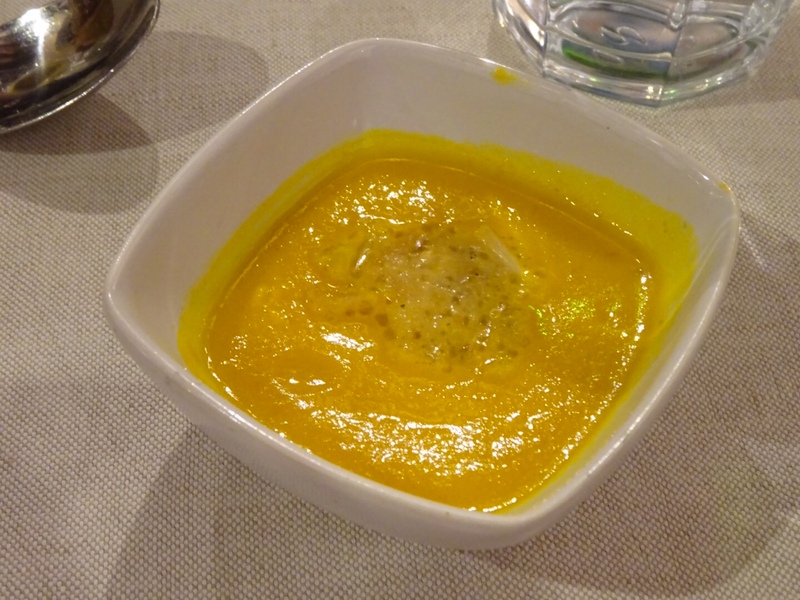 I don’t remember the exact description, but I believe it was squash soup in June, then some sort of green vegetable soup in November. Both were quite tasty. Everything we had in June was so delicious, that I essentially ordered the exact same items when I returned alone in November. I started with the Red Tuna Seasoned in Olive Oil: “red tuna from Sicily kept in olive oil jar, seasoned in olive oil 2012, served with Romanian grilled artichokes and Borettane onions.” It reminded me of a delicious tuna conserva (fresh tuna poached, seasoned, and stored in olive oil) that I once had at Aatxe. 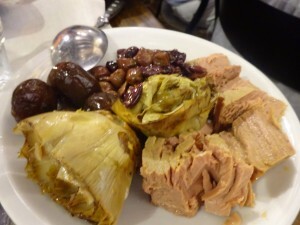 I definitely enjoyed this dish more in the summer when the artichokes were fresh and grilled; when I returned in the fall, artichokes were out of season and the restaurant served preserved artichokes. 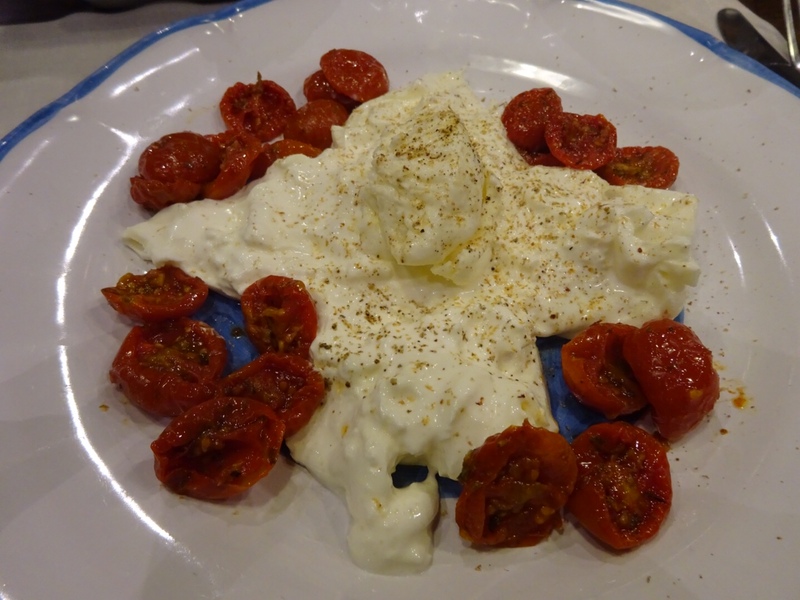 The second starter was the Pugliese Burrata with Baby Tomatoes: “burrata cheese garnished with black Malaisian Crusche pepper and sundried cherry tomatoes.” This dish did not appear to change much from June to November, despite the fact that it was past tomato season. The burrata was heavenly and the tomatoes were sweet with a rich umami flavor that develops from the roasting process. Rome is famous for its pasta carbonara, so we had to order La Carbonara: “spaghettone pasta tossed with crispy pork cheek, Masaisian black pepper, Paolo parisi eggs, and Romanian Pecorino cheese D.O.P.” Jack and I ate a lot of carbonara pasta when we were in Rome, and this was hands down our favorite version of the classic recipe. 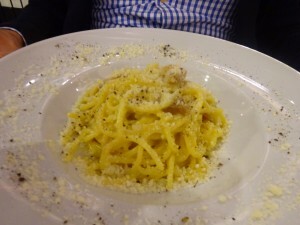 The pasta was cooked perfectly al dente (“to the tooth”), and the large pieces of pork cheek were salty and crispy. It may be the best pasta dish I have ever had. When I returned in November, I had to have this dish again! 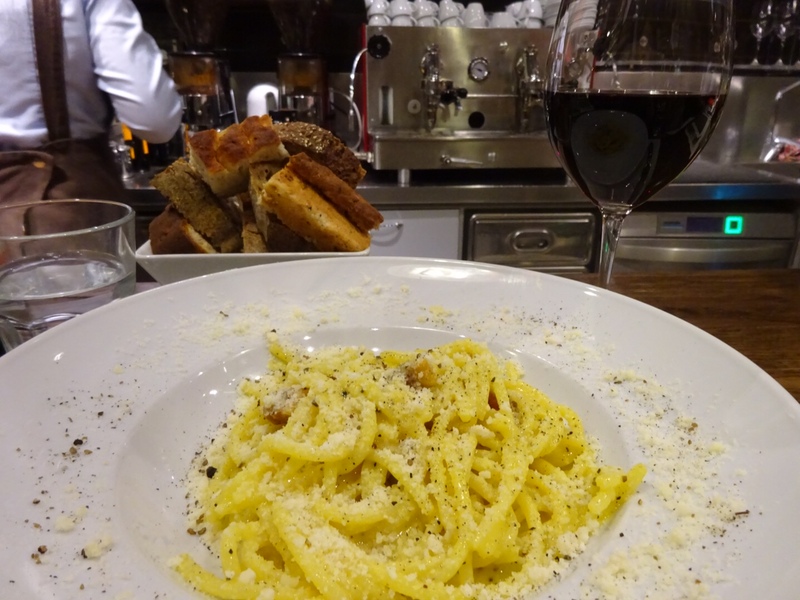 Pasta alla Carbonara: Pasta with eggs, pancetta (salt cured pork belly) or guanciale (salt cured pig’s jowl or cheeks), and black pepper. There are many conflicting stories of its origins, a popular one being that it came about in the 1940’s after the liberation of Rome, when many Italians were eating powdered eggs and bacon supplied by troops from the United States. Pasta all’Amatriciana: pasta with guanciale, Pecorino Romano cheese (made from ewe’s milk), and tomato. It originated in the town of Amatrice (in the mountainous province of Rieti). Cacio e Pepe: pasta with black pepper and Pecorino Romano cheese. Means “cheese and pepper” in several central Italian languages. We ordered a few more dishes during our first visit to Roscioli including Potato Gnocchi with tomato and black Strolghino (salami) from Parma, Two Mini Piemontese Beef Tartars (one “classic” with quail egg and one topped with oyster and saffron pearls from San Gimignano), and Sorbetto di Frutti Fresca. Everything was top notch, but the items pictured above were the standout dishes (hence my exact same order when I returned later in the year). 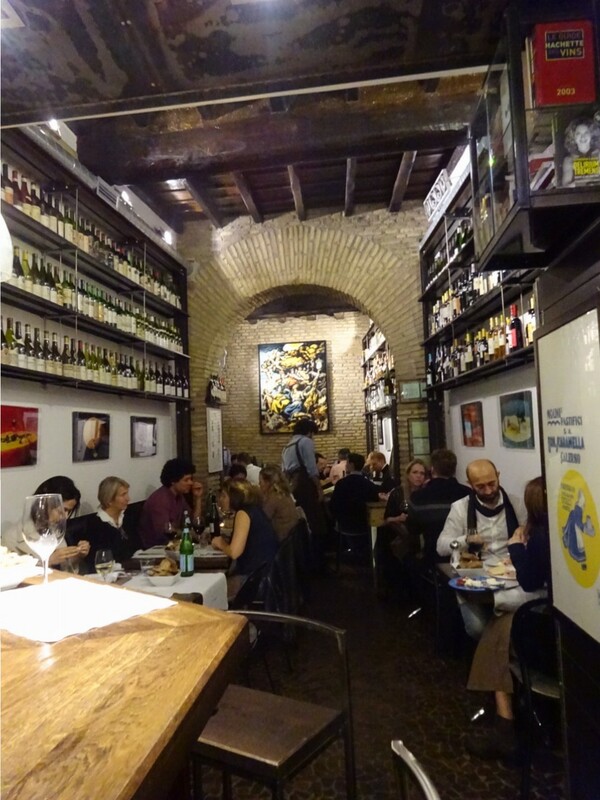 If you are looking for a fun atmosphere with incredible food (and perhaps the best carbonara pasta in all of Rome), then I highly recommend you stop in for a bite at Salumeria Roscioli. Salumeria Roscioli (Ristorante): www.salumeriaroscioli.com Via dei Giubbonari, 21 00186 Roma. info@salumeriaroscioli.com Booking: +39 06 6875287 Hours: Lunch 12.30-4pm; Dinner 7pm-midnight. Closed Sunday (except the last three Sundays in December). Rimessa Roscioli (Wine Tasting): www.winetastingrome.com Via dei Giubbonari, 21 00186 Roma. winetasting@salumeriaroscioli.com Wine and food tasting dinner: Tues – Sat at 8pm. €65 per person. For last minute bookings (the same day of the tasting) please call +39 333 7780024 or +39 06 64760611. This is perfect. We will be in Rome and the Amalfi Coast, also Sicily and Tuscany for 5 weeks in April and May. I am writing down all of your recommendations.